Ford is supporting this year’s Road Safety Week, coordinated by safety charity Brake. The week, from 19-25 November, is the largest road safety event in the UK, and looks to promote life-saving messages throughout schools, communities and organisations. Ford has announced its Share The Road campaign, which backs up Brake's BikeSmart campaign. Whether you are a driver, pedestrian or cyclist, road safety affects you. If roads and pavements were not safe, your children would struggle to get to school or to the park. Elderly people would struggle to go to the shops and stay mobile. People would be less able to cycle, and you wouldn’t feel so safe in your neighbourhood. The UK’s road safety may be good, but it’s still far from perfect. Five people die every day on our roads, and as many as 60 more sustain serious or life-changing injuries. 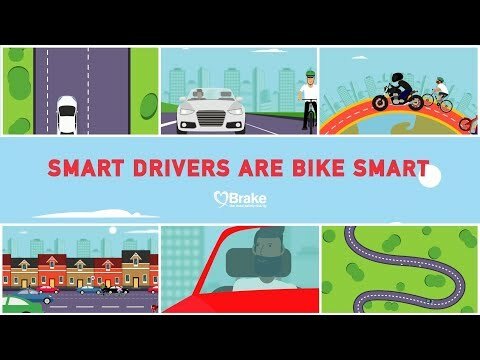 Throughout Road Safety Week, Brake’s BikeSmart campaign will raise awareness and fundraise. One way the charity plans to do this is a huge static cycling event. Collectively, they want to cycle 9,740km on exercise bikes, to represent the 9,740 cyclists and motorcyclists killed or injured on the UK’s roads in the past year. You can join in this event to help them reach their goal – to be part of this year’s event, or to organise your own event, click here. Brake will also run road safety workshops in schools up and down the country. Workshops are a great way to engage children and educate them about how to keep safe on or near the road. Plus, on Friday 23rd November, many Ford employees will be dressed as Road Safety Superheroes to raise funds for this great charity. Part of Ford's scheme is WheelSwap, an innovative virtual reality experience that you can experience at home or at a Ford Driving Skills For Life event. It enables users to see from a cyclist’s or a driver’s point of view. The aim of WheelSwap is simple: to encourage people to make a few small changes to the way they drive or cycle so that everyone is a bit safer on the road. Ford also wants to improve urban mobility throughout the world, with car-sharing and e-bike programmes. As well as supporting initiatives to improve road safety, Ford is making its cars safer by incorporating the very latest technology. As an example, the All-New Ford Focus includes pedestrian detection, automatic emergency braking and post-collision braking as standard, and many other features like Blind Spot warning are available too. Ford has teamed up with Brake to create tips on how you can effectively share the road - download the PDF here.